It's been so hot here that the finish has set up quickly, so here are a few photos. Right handed bow is curly Bubinga with a phenolic stripe and the left handed bow is laminated Purpleheart and faded Padauk. Actionboo limbs under black glass. I'm in for the right hand. This would be perfect for my son as he grows up! Thanks for the generosity! Put me in for the right hand, Thank you. Well done Richard! Someone is going to get something special. Super nice of you Rich!! I got both 3 rightys and a lefty,,,,put me in! If possible a chance on each? 2 grandaughters one lefty one righty they are beautiful. Thanks for the chance. VERY NICE - And an even better making a couple kids day!! I just wanted to comment, save my spot for someone else. I meant the bows are beautiful, but the girls are too. Please add me for the righty! Thanks for your generosity. I've got a 5yr old daughter that would love the right hand model. Took an attempt to make here a long bow a while back and she enjoys shooting that. Those two bows are a work of art that any child will love. Good luck to all participating and thank you for the opportunity. My grand daughter would love this. Im in for the right hand bow.Thanks! So pretty! I'm in for righty for grandson. Please throw me in on the righty. I got 3 youngsters in the house. Richard you are the man. Please put me in for both. My niece is a righty and her brother is a lefty, they are sharing a dual shelf fiberglass bow I bought them right now. Put me in please for a righty. Have several grandkids that would be super happy with one. They are beautiful. Thanks so much. Wonderful you are doing this Richard, beautiful bows also. I do not need a spot, but whoever gets the bows will surely enjoy them. So generous ! Put me in for the righty please. Thank you ! put me in for the right hand please. All set for bows for awhile, just wanted to say you rock! A couple lucky kids will be smiling soon! I am in for this one. My son would love a bow. Would love to be in for the right hand for my little guy Beautiful pieces of fuctional art there. Very generous offer. Count me in for a right handed one. Thanks! Most my grandkids are right handed. thank you for the chance. Right hand for my grandson Tyson! Please put me in for the RH bow. I have a friend with three children who love archery. They are using a loaner bow right now. Beautiful work! Thanks for the chance. Right hand for my daughter thanks! Two sweet looking bows. Nice job. I'm In for the right hand bow. Thanks! Right please, got 2 that would love that! I have a 6 year old granddaughter that tries to shoot my 45# selfbow that would love to have a left handed bow to shoot with her g-pa. Please put Madelyn in for the left handed, and THANK YOU very much for the gesture. Please put me down for the right hand one. My grandson would love that. Very cool! I have a righty. What generous offer. I'm in for the righty. Do not enter my name, but Thank You for your generosity. Please put us in for the righty. I bought on from you a couple of years ago it is 54" 32# made 2/16 It looks and shoots great the older grandkids 8 and 10 enjoy shooting it. Birdseye maple in the riser! Thank you for the generous offer. This is awesome. In for a lefty!?? Beautiful bows!! My young grandson could use the lefty. Wow those are great. In for the righty! Very nice of to offer up these bows. My grandson oils be in awe. In for the righty. Very generous of you and I comment you for having a good heart. I have three daughters we adopted and two are covered with bows but we have one that could use a right hand! Please include Ande our oldest. Great job on the bows. I'd like to throw my name into the mix to win one of right handed models for my grandson. Although the only drawing I've ever won was the draft lottery back in 1970. You can imagine the prize I won. I joined the U.S. Navy, and they still wanted to send me over there only instead of carrying a gun, they wanted to give me a band aide and put a cross on my helmet to aim at. LOL! If only the world had more considerate people like you, it would be a better place to live. Thanks much. Perfect for my grandson. Put me in for the RH. As always, they are beautiful bows! Please put me in the drawing for the RH. Richard, After giving this much thought please remove our daughter Ande from the drawing sir. I got to thinking she may have outgrown that weight for the right hand and this would give another kid a chance to win with her name removed. Still this is a very great thing you and your wife are doing for the little ones. God loves to see folks do these kind of things when their talents are used especially towards the children I'm sure. Please put my grandkids in for the right handed bow. two of them would love it. Please put me in for the right hand. Thank you. WOW! You are a good man. 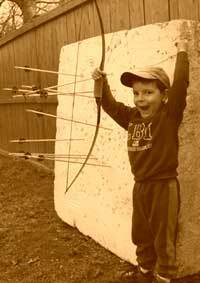 I have a grandson who I would love to shoot with, of course I will buy him one if I have too. Put me in for the right hand model. You stated it warms your heart to get kids involved, that warms my heart. My grandkids would love a chance at the right hand one. Thank hank you. Thanks for the opportunity buddy. I have a granddaughter who is left-handed. Just hit 5 yrs old so she would get lots of shooting with this one. Thanks again. i run archery ranges for the boy scouts. i could use both of them please , thank you. Neighbor kid next door looking for a lefty.Thanks for your generosity. I'm in for my son Bubba. I’m in for the right hand. Perfect for my son. Thanks! I'm in for the right hand bow. Very generous offer, Thank you. Rt. Hand for the grandson. Put me in for a lefty for my neighbors son he would love it,thanks for your generosity. Righty for my granddaughter. Thank you!